Papier-maché impression from cookie mold, Carl W. Drepperd, ca. 1942. Yuletide has arrived at Winterthur, and visitors can enjoy the treasures of Christmases past by exploring various customs, decorations, and stories. Whether it is sending holiday cards, trimming a tree, or eating festive cookies, families have new and old traditions. An intriguing set of papier-maché impressions in Winterthur’s collection reflect some of those traditions, tying together multiple Christmases past. The remainder of the impressions in the collection probably come from this letter. They include figures of a stork with a baby, a sunflower, a beast, another tall bird, and a rooster. In fact, Drepperd frequently included these molds in his books as illustrations. In his Primer of American Antiques (1944), under the chapter on woodenware, he featured a mold with a stork and baby in its beak. The same mold appears in his Pioneer America: Its First Three Centuries (1949), but this time the mold seems to be carved from the same block of wood as the sunflower mold. Under Drepperd’s definition of machpane and marchpane molds in A Dictionary of American Antiques (1952), he claims that he has “a dated example of 1563,” (3) probably referencing the triangular figure. These molds were made using the intaglio manner, carving into the wood rather than creating a raised surface. They were pressed down into the dough, thus leaving an impression behind. Many times the designs were taken from printed sources, which can help with dating, though molds continued to be long used after they were made. 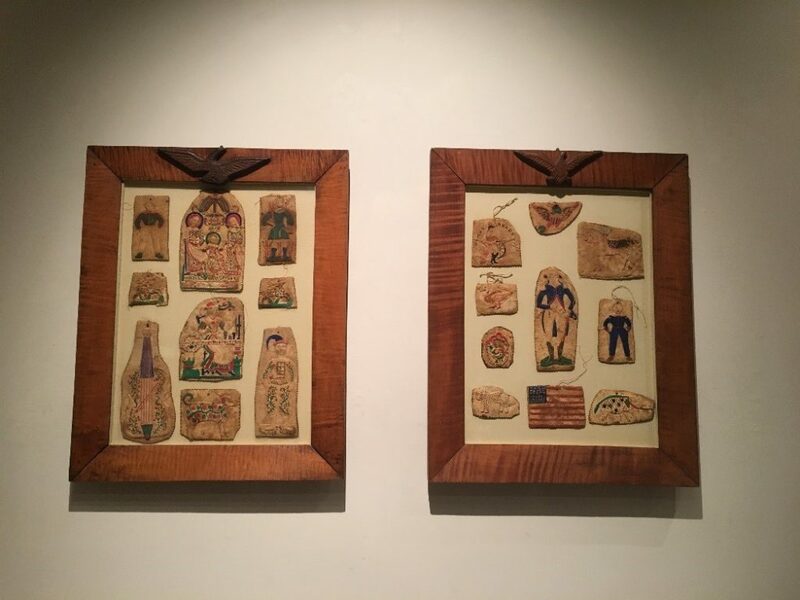 Some molds have been attributed to specific carvers, such as the best-known American mold carver John Conger, who worked in New York City from 1827 to 1835. More often, molds remain unattributed and without a date. It can be difficult to differentiate between the various types of molds, as terms such as cake molds, marzipan molds, cookie molds, and springerle molds, have been confused and conflated, and it is possible that they were sometimes used interchangeably with various types of cookies. While Winterthur does not have Drepperd’s molds, we have similar ones, as seen on display in Shipley Hall on the Yuletide Tour, which feature animals, flowers, elaborately dressed women, and letters. The molds Drepperd had in his collection were most likely used in Pennsylvania during the early 19th century. He believed that they were used with matzabaum (also known as marzipan or marchpane), which he defined as “a sweetmeat made from almond meal and honey, molded in wood forms, and often decorated with vegetable colors,” (4) though more recipes use sugar and almond paste as well as orange or rosewater. (5) The treat has a long and diverse history, as noted by the various names by which it is known. One of the key ingredients, almonds, were cultivated along the eastern Mediterranean, and spread throughout southern Europe during the Roman Empire. It is believed that the word marzipan has either a German (marcipan) or Italian (marzapane) origin, but it could also refer to the Persian martabān, possibly pointing to the city of Martaban that was famous for exporting glazed jars filled with sweetmeats. Other scholars have attempted to tie the Latin phrase Marci panis, meaning the bread of St. Mark, to the Italian word. (6) Regardless of etymology, the sweet has a history of being used for elaborate sculptural sweets for holidays throughout the Mediterranean, Middle East, and Europe, and recipes appear in many cookbooks starting in the medieval period. One of the earliest marchpane recipes printed in America is found in Eliza Smith’s The Compleat Housewife, or, Accomplished Gentlewoman’s Companion­. For those who did not want to use expensive almond paste to create ornaments that would not be consumed, people sometimes used corn meal or wheat flour and glue. (8) While the cookies rarely survived, Winterthur has a framed collection of brightly colored ‘marzipan’ cookies that were probably used as ornaments, and now featured on the Yuletide Tour. Preserved for at least 150 years, the actual ingredients used in this grouping are unknown. Conservation conducted in 2000 to remove mold and make repairs led us to believe that they are more likely made out of wheat flour than almond paste. Left: Marzipan ornaments, ca. 1800-1875. Bequest of Henry Francis du Pont. 1959.0844. Right: Marzipan ornaments, ca. 1800-1875. Bequest of Henry Francis du Pont. 1959.0845. Similar to the impressions on paper, these ornaments show brightly painted raised figures in various forms, e.g. patriotic, religious, and fanciful themes. The old recipes required that sugar and eggs be beaten together for at least an hour. Then the flour was sifted several times, resifted with the hartshorn, added to the eggs and sugar, and the whole stirred again. Then lemon, anise seed, and grated rind were added and the dough rolled out. The pictures were separated along the dividing lines to form square cookies. Springerle molds are usually flat boards that can contain anywhere between two and thirty-two squares of designs. Since Drepperd created two of his pressings in pairs, it is possible that they came from springerle boards. These cookies were also used to decorate Christmas trees, sometimes painted to create a colorful effect. 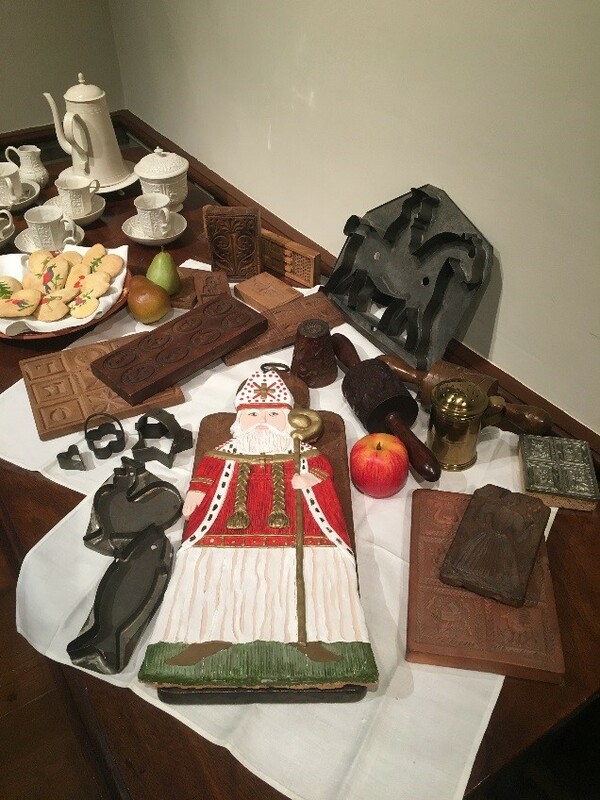 Drepperd’s papier-maché impressions show that molds were once used to create cookies, for either consumption or decoration, possibly during the holiday season. In the same spirit, Drepperd decided to use the molds to create a lasting Christmas wish to his friends, including du Pont. Today, Winterthur uses papier-maché pressings inspired from these designs on the Yuletide tour. You can find some of these impressions on the Christmas tree in Empire Hall, representing pieces of history that show multiple traditions and long-lasting appreciation. Christmas tree featured in Empire Hall with ornaments inspired by Drepperd’s impressions. 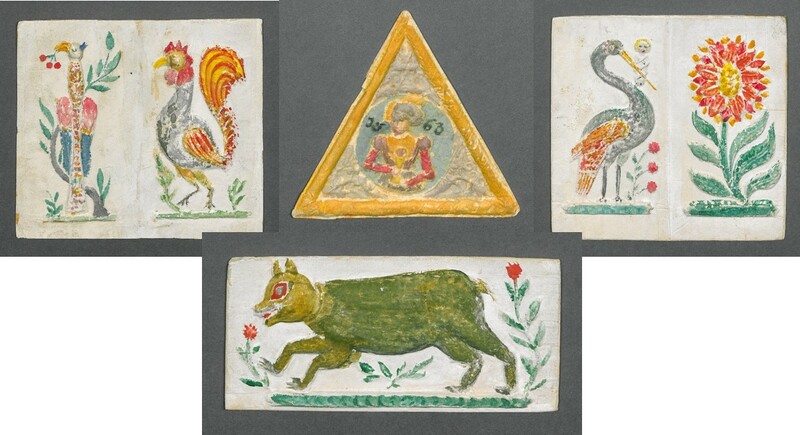 Winterthur is very grateful for funding from the National Endowment for the Arts, which has given us the ability to photograph and digitize works on paper in the collection, including these papier-maché impressions. Makanowitzky, Barbara Norman. Tales of the Table: A History of Western Cuisine (Englewood Cliffs, N.J.: Prentice-Hall, 1972). Weaver, William Woys. “Cake Prints, Carved Molds, and the Tradition of Decorative Confections: The Adomeit Mold Collection.” The Magazine Antiques (Summer 2010): 158-167. (1) Henry Francis du Pont to Carl W. Drepperd, 2 January 1942, Series 69HF3, Box HF552, Folder Dreppard, Carl W. (1941-1949), Henry Francis du Pont Papers, Winterthur Archive, Winterthur Library. (2) Carl W. Drepperd to Henry Francis du Pont, 23 April 23 1943, Series 69HF3, Box HF552, Folder Dreppard, Carl W. (1941-1949), Henry Francis du Pont Papers, Winterthur Archive, Winterthur Library. (3) Carl Drepperd, A Dictionary of American Antiques (Boston: C.T. Branford, 1957), 234. (4) Drepperd, A Dictionary of American Antiques, 234. (5) Linda Campbell Franklin, 300 Years of Kitchen Collectibles, 4th ed. (Iola, WI: Krause Publications, 1997), 151. (6) Alan Davidson, The Oxford Companion to Food, 1st ed., s.v., “Marzipan” (Oxford: Oxford University Press, 1999). (7) Alfred L. Shoemaker, Christmas in Pennsylvania: A Folk-Cultural Study (Mechanicsburg, Penn: Stackpole Books, 1999), 21. (8) Phillip V. Snyder, The Christmas Tree Book: The History of the Christmas Tree and Antique Christmas Tree Ornaments (New York: The Viking Press, 1976), 46. (9) William Woys Weaver, America Eats: Forms of Edible Folk Art (New York: Harper & Row, Publishers, 1989), 116. (10) Ruth Hutchison, The New Pennsylvania Dutch Cook Book (New York: Harper & Row, Publishers, 1958), 190. 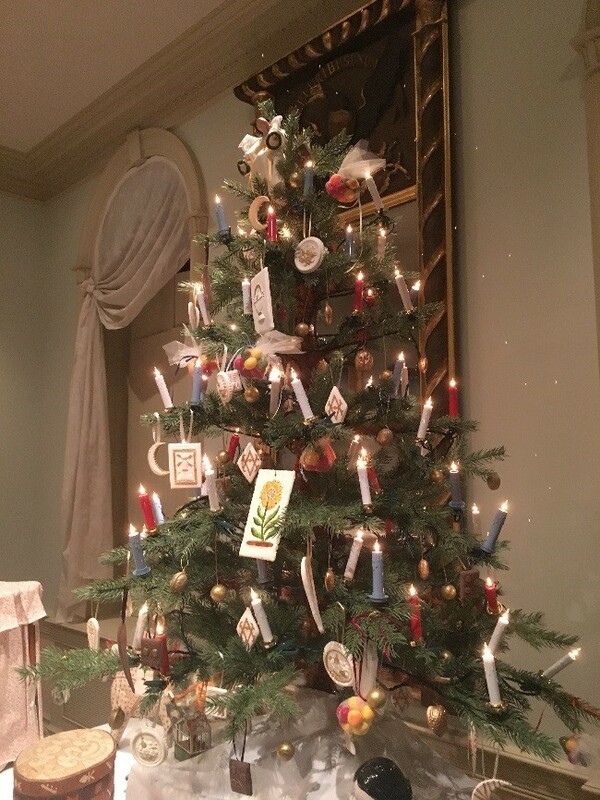 This entry was posted in Academic Programs, Decorative Arts, Du Pont Family, Library, museum collection, Uncategorized, Yuletide and tagged Christmas tradition, H. F. du Pont, Pennsylvania German, Winterthur Museum Garden & Library, Yuletide. Bookmark the permalink.